Picasso's recent color experiments burst onto the canvas in full technicolour glory as he returns to his favorite them and personal passion: the bullfight. In later life he admitted that he often painted bullfights, traditionally held of Sundays, when unable to attend. This work was completed at Boisgeloup, the chateau 40 miles north-west of Paris, which Pacasso, now fabulously wealthy, bought in 1930. The central images of the panicking grey horse, with its heavy brushstrokes, acts as an imposing tonal contrast, in order to exaggerate the use of color that capture the moment of the bullfighter's death. We hardly notice that the butchered horse is dying because the entrails are grey in tone. The absence of gore from horse and man is taken up by the referent image of the red cape, which swirls in a bloody cloud between the bull and the fighter who fails, like his cloak, between the two beasts. Color creates a powerful sensation of crackling energy, violent movement and death. 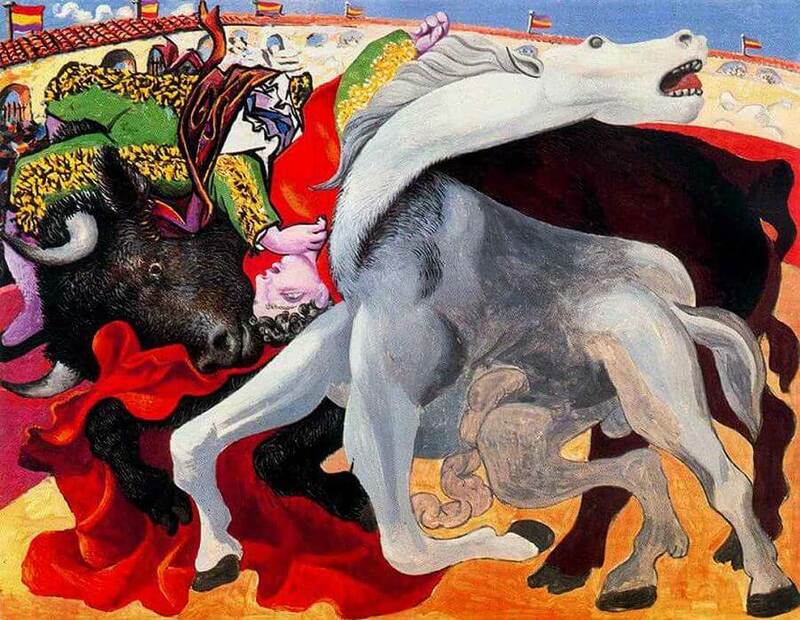 Picasso increasingly fixates on this theme in a prophetic series, which builds towards the celebrated Guernica (1937), his response to the Spanish Civil War, in which this horse's head reappears. The bull's stunningly detailed profile also frequently recurs in the lead up to Guernica.